About four years ago, Zech Strauser suggested that one of his commercial resort clients do something a little different with a large, unused green space next to its basketball courts. The project, completed by Strauser for free, turned 8,000 square feet within a 2-acre space into a sustainable plant paradise. It includes native grasses and wildflowers that attract butterflies and hummingbirds, and it provides attractive displays of color from spring to fall. That project was a turning point in Strauser’s career and helped reignite his passion for the green industry, which he entered 20 years ago when he started mowing overgrown foreclosed properties with a borrowed push mower. Strauser Nature’s Helpers has since become a $3 million to $4 million company that provides 75 percent maintenance and 25 percent design/build services to a 20 percent residential, 80 percent commercial clientele. The company employs 15 to 20 year-round team members and another 20 to 30 seasonal and part-time employees, depending on the severity of the snow season. After about 15 years of steady growth, Strauser began to feel as though he’d lost his way. He says he believed there must be more to the landscape than green grass and mulched beds. Strauser reflected on the reasons he entered the landscape industry initially, such as his love of the outdoors and being able to get some dirt on his hands. He recalled his nontraditional upbringing as a home-schooled student and the way his family “lived off the land,” spending countless hours working in their large gardens. Those experiences prompted him to reevaluate the direction his company was moving in and think of how he could do things differently to better align with his core values. Some companies in the industry are actually “ungreen,” Strauser says, pointing to chemicals, emissions and other outputs that can be harmful if handled improperly or left unchecked. So Strauser implemented a four-part approach he calls “A Better Way,” which breaks down the components of a landscape project. He looks at each project’s environmental rewards, financial and aesthetic benefits, and how people can have more interaction with the landscape. 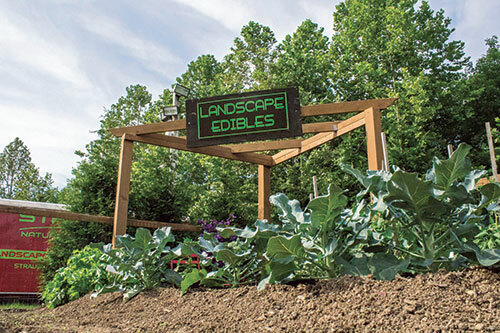 His goals include decreasing lawns by 30 percent and replacing them with organic, native plant mixtures and reducing mulched areas by 60 to 80 percent by filling beds with plants. Strauser says a tremendous amount of resources goes into creating and maintaining large green spaces that he sees going unused. Landscapes that incorporate native plantings can be low impact and require less mowing and fewer chemicals to maintain, while creating wildlife habitats, he adds. Strauser spreads his message through his involvement with organizations such as Come Alive Outside, a nonprofit that works with landscape professionals and other groups to inspire communities to enjoy outdoor spaces, and the Chesapeake Bay Landscaping Council, which recently introduced the Chesapeake Bay Landscape Professional Certification, a formalized set of sustainable landscaping standards for the region’s landscapers. Strauser says 180 contractors—himself included—will receive the certification by the end of this year. Strauser says getting more people on this bandwagon is one of the biggest challenges to changing the public’s perceptions of outdoor landscapes. Education will play a huge role in getting contractors and clients alike to understand and become receptive to the idea of converting unused green spaces to prairies and meadows. Since landscapes are largely driven by building developers, Strauser says they, too, need to be educated about the ins and outs of natural landscapes to ensure they are being implemented correctly from the start. Design software: Which do you prefer and why?